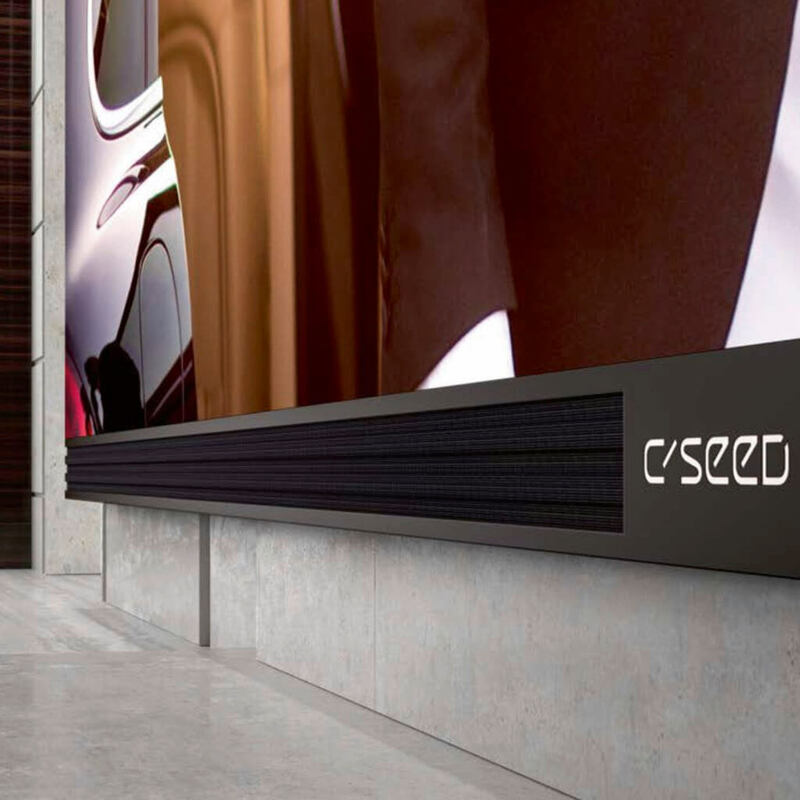 C SEED moves indoor, introducing the BLADE 262: An enormous 241.89" x 101" (6144 mm by 2574 mm) 4k-LED display with black LED technology for highest contrast, latest UHD technology for a totally dynamic picture with a color spectrum worlds beyond conventional TV screens, stunning 800 nits brightness for perfect viewing experiences in even brightest daylight conditions, onboard 4k-media server and six integrated high-end speakers for total quality sound in 7.1 or 9.1 cinema surround configurations. Lean back in your favorite fauteuil and switch the remote control. Watch the customized fabric cover fold away to reveal the huge 4k-LED TV. Pick content from the integrated 4k media server and enjoy a viewing experience that, up to now, was simply unavailable outside a private movie theatre in a remote corner of your mansion. 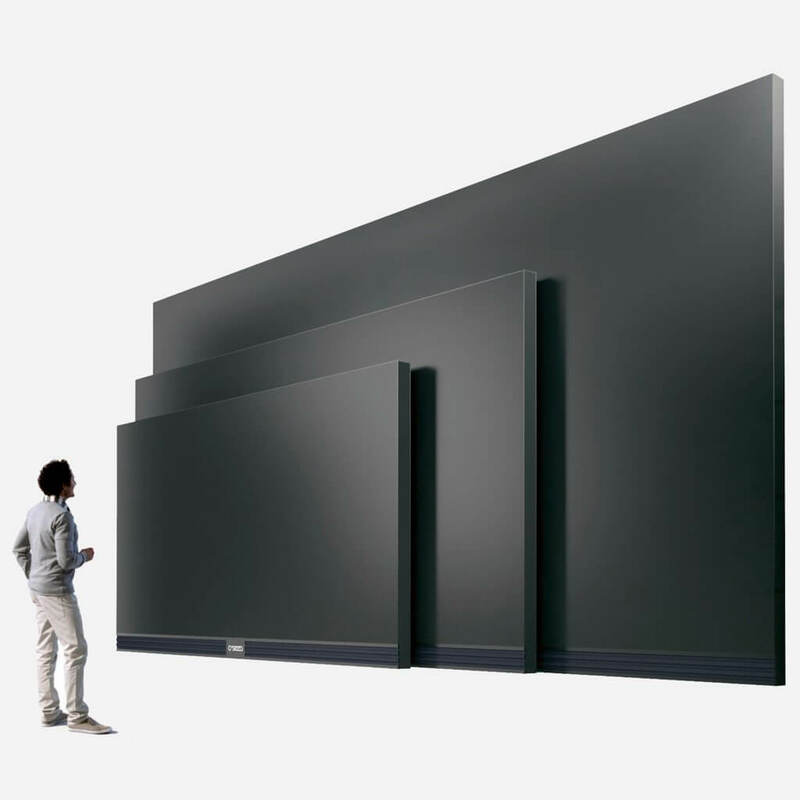 Movie screen sized indoor TV is now available for a wide variety of room configurations: C SEED offers the complete total quality indoor TV technology package in three screen diagonals, from the record 262" to the still huge 157". The C SEED 201 and the C SEED 144 packs its ultra-powerful technology into a rigorously streamlined aesthetic created by Porsche Design Studio. Simplicity of form, durable high-grade materials and impeccable workmanship are combined in an austerely imposing installation. Latest SMD-LED technology provides the giant Blade 262/197/157 with an unparalleled color spectrum, light years beyond the performance of standard LCD TV screens. 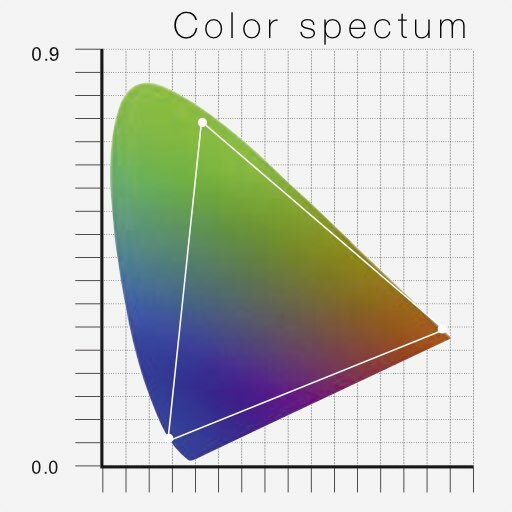 Blackface LED's produce a superior contrast ratio of > 5000: 1 and if needed, total black. 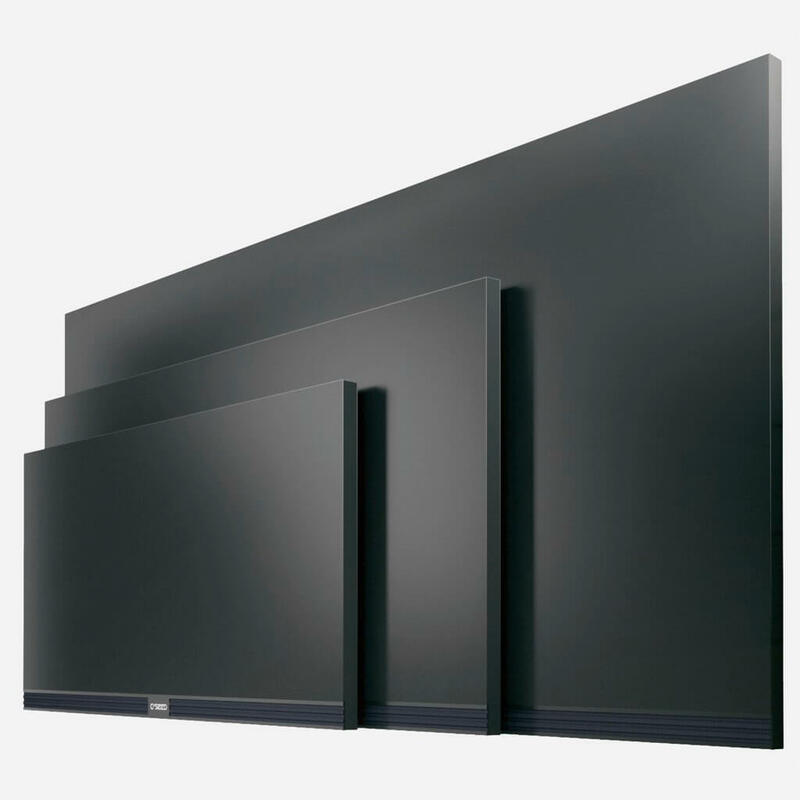 All Blade 262/197/157 TVs come in the special Super Cinemascope 4k format for a totally immersive cinema experience. The elegance of this wide format screen and its impressive size, with totally seamless engineering of the LED technology, transcend conventional large-screen TVs and the experience they give, rather creating the impression of a great work of art. 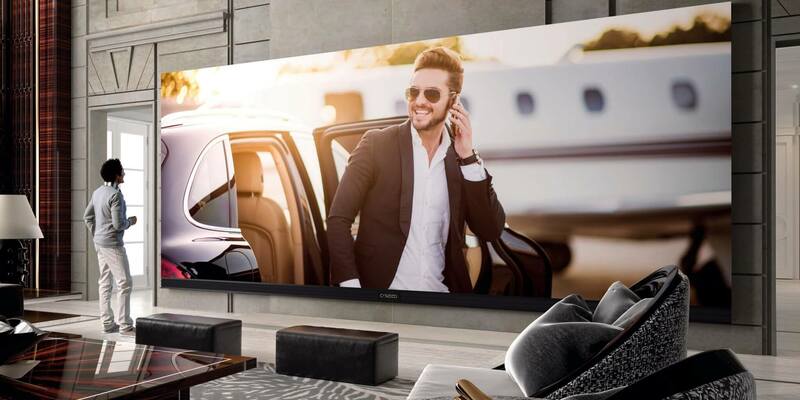 With 800 nits brightness and superior contrast ratio, the 4k SMD LED screen provides a uniquely cinema experience in absolutely all ambient light conditions. Enjoy picture-perfect entertainment even in glaring sunlight flooding your living room. Highly saturated colors and a bottomless deep black are benchmarks of superior picture quality and picture processing power. The Blade 262/197/157 TVs use state of the art HDR processing, supported by 18-bit grayscale processing, to create a truly overwhelming viewing experience. A 160° viewing angle without any brightness drop-offs or color shifts is exceptionally rare even on much smaller screens. With this performance, the giant Blade 262/197/157 places itself in a whole new category. Blade 262/197/157 carries six high-end mid-range speakers and six high-end tweeters in its sound-bar, which is sufficient to turn even the largest living rooms into concert halls or movie theaters. In spite of all the sound power it packs, the 262/197/157 is also capable of total silence, because it does not carry a cooling fan. Enjoy the Sound of Silence on a whole new level. 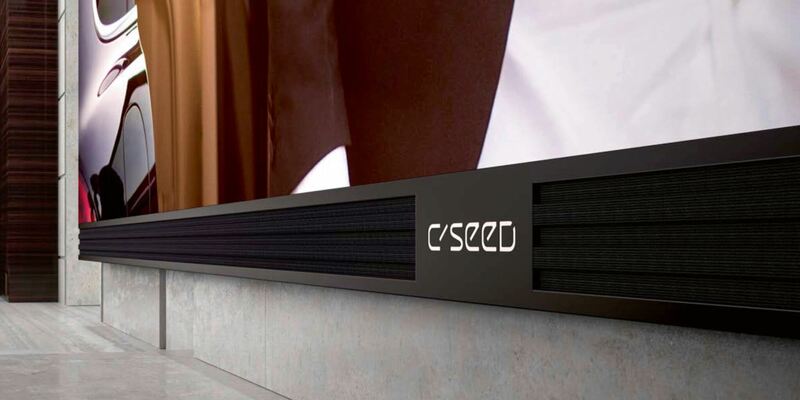 The C SEED comes with its own media server which can be combined with almost any high-end home automation system or individual surround audio system. C SEED's specially designed 2.4 GHz radio remote control covers distance up to 25 meters, enough for large rooms. The first truly high-end and super custom integrator in South Florida. dmg-mg is a certified direct dealer and integrator of C SEED for commercial and residential applications in the Miami / Fort Lauderdale area. Ensuring peace of mind, for the best price, professional custom installation, and warranty protection of your ultra high-end, motorized, Retractable, Super-marine Giant Outdoor LED TV. The world's best Outdoor Speaker System. Giant, Retractable Outdoor LED TV.